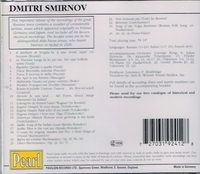 “Smirnov made his French début at the Paris Opéra in 1907. His successful Parisian performances led to an invitation for him to appear at the Metropolitan Opera, where he sang in 1911-12. Competition from the celebrated international tenors Enrico Caruso and John McCormack, who were also singing at the Met at that time, resulted in Smirnov's achieving limited success with New York audiences. In 1914, he performed in the ‘Russian Seasons’ at London's Theatre Royal, Drury Lane. He would not sing in the United States again except for two performances of PIQUE DAME with the Washington National Opera — a semi-professional company not related to its present namesake — in 1926.